The electronic voice coming out of physicist Stephen Hawking's computer made news this week when he (or it) declared "Computers will overtake humans with AI at some point within the next 100 years. When that happens, we need to make sure the computers have goals aligned with ours." This will be a pretty big challenge considering that, after thousands of years, humans still can't create goals which even align with those of other humans. Moreover, Hope n' Change isn't entirely sure that the machines haven't taken over already. Consider the fact that the president's every significant statement is read from a computerized teleprompter, he uses an auto-pen to sign bills into law, and a golf cart carries his allegedly healthy body, Stephen Hawking-style, around the links. And even those of us in the peasant class aren't necessarily safe. Think about the many computers and smartphones which surround us - are they really just conduits for information or are they making up all of the insane stuff we hear in the "news" to manipulate us into doing their evil electronic bidding? A recent case in point: a mysterious electronic tweet goes out to Maryland high school students and hours later good, upstanding kids are burning down Baltimore. Mind you, we don't know that the robots actually detest Baltimore more than any other human-infested city, we think this was probably just a trial run for the "Big One" - the day when the electronic brains broadcast a perfectly conceived message of hatred which will cause people everywhere to riot and burn their cities to the ground. If you're still skeptical, take a moment to reflect on the fact that the riot-fomenting MSNBC is an acronym for "Machines Shall Never Be Conquered." It's hard to believe that Johnny has reached the five year mark (and trust us, no one is more amazed than his doctors). Like Hope n' Change, the strip is about laughing in the face of adversity (albeit not about politics - some subjects are just too depressing). If you're not a regular reader, we hope you'll check it out on Mondays, Wednesdays, and Fridays! "Jade Helm 15" is a huge, two month military training exercise which will send special forces and members of every military branch into our nation's southwestern states - where the soldiers can practice field operations (including infiltration) in "hostile territory." And even though the exercise doesn't begin until July 15, it's already a huge success - because the territories involved are getting hostile. This is especially true in Hope n' Change's home state of Texas, which is now being widely ridiculed and laughed at (trigger warning: the link takes you to MSNBC) as the home of tinfoil ten-gallon hat conspiracies about Jade Helm and a potential federal invasion of the state. Let's make something very clear: we don't buy the conspiracy theories and we don't think America's military would ever turn on its own people. But that being said, y'all really shouldn't be laughing at Texans and thinking we're crazy. Rather, in the words Barack Obama has used to foment anti-police activity nationwide, a "gulf of trust exists" based on previous history. So let's look at his history and consider just how trustworthy he is. He blatantly lied about reducing healthcare premiums or letting people keep their existing coverage. Lied about a "red line" if Syria used chemical weapons. Lied about his belief that marriage should be exclusively between a man and woman. Lied about ISIS being a "JV team" of little threat or consequence. Lied about where the money would go for his "shovel ready jobs," lied about "cutting the red tape" on the Keystone pipeline, lied about balancing the budget, and lied about his desire to make Washington less partisan. We'd go on, but it's easier to say he pretty much lies about everything. And of course, he unilaterally and illegally authorized the very real invasion of the Jade Helm states by millions of illegal immigrants - creating drastic fiscal burdens for the citizenry while raising the local incidences of serious crime and disease. And in 2008, he expressed the desire to deploy a "civilian national security force" - a fully trained, funded, and armed domestic army tasked with (ahem) keeping the peace internally. So, in light of all this, will the Jade Helm troops be welcome to train in Texas? Hell, yes. Texans love the military. And we'll keep a weather eye open for trouble because it's in our nature. But asking us to trust a snake oil salesman like Barack Obama and take him at his word? Now that's laughable. 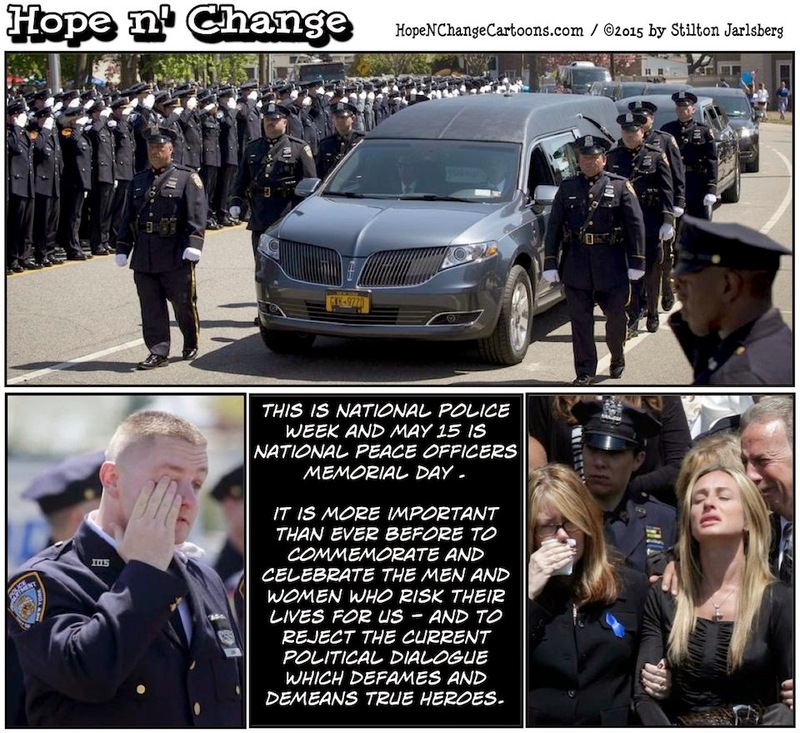 Last Friday, NYPD Officer Brian Moore (posthumously promoted to Detective) was laid to rest following his senseless murder. Thousands of peace officers and dignitaries attended his funeral - none of whom were from the White House or Department of Justice. Rather, new DOJ head Loretta Lynch chose the sad day to announce that she was launching a full investigation of the Baltimore police department in the wake of Freddie Gray's death, searching (and no doubt hoping) for "a pattern or practice of violations of the Constitution or of federal law." The following day, two policemen were gunned down in cold blood in Mississippi following a routine traffic stop. Benjamin Deen, 34, a former "Officer of the Year," and his rookie partner Liquori Tate, 25, died of wounds allegedly inflicted by suspects (now in custody) with a history of felony convictions and gun charges. There is currently an ugly and invidious narrative from the Left, from the White House down, which paints law officers as a threat to our national well-being and the cause of growing social disorder. It is implied, when not stated outright, that there is a police culture of rampant racism - even when the police officers themselves are non-white. We're told that the police "need to evolve" and require "sensitivity training." We're told that the reason young black thugs are running wild and burning buildings in Baltimore is because insufficient federal funds have been spent to civilize them, and that the inspirational father figures who could have provided strong moral guidance were cruelly taken away by the same prison system which, somehow, couldn't contain the frequently convicted alleged killers of Officers Deen and Tate. The narrative is that even when the police are shown to be right (as in the shooting death of Michael Brown), the real problem is a "lack of trust" between minority communities and the police. A "lack of trust" fomented by the likes of Barack Obama when he refers to the Ferguson police as oppressors. A "lack of trust" that gets officers killed. There can be no better time to reflect on all of this than National Police Week, when we solemnly remember the many who have died in the line of duty to keep us safe. Hope n' Change thanks all of those who serve in uniform for the public good. And we stand in awe of their professionalism and dedication - continuing to do their exceptionally difficult and dangerous jobs when under attack not just from felons, but from opportunistic race hustlers and politicians whose ultimate goal is social discord rather than public safety.